Each year, monarchs congregate in colonies along the California coasts. Although not as well-known as the colonies in Mexico, the overwintering grounds of the western population are also critical for their survival and monitored each year by volunteers for the Xerces Society. The "Thanksgiving" Counts are performed each year in the fall after monarchs have returned from their breeding grounds. Although 450 sites have been documented as having supported monarchs at some time, under 300 sites are regularly counted. The main colonies are monitored every fall and other colonies less frequently. This program keeps track of the overwinter populations. 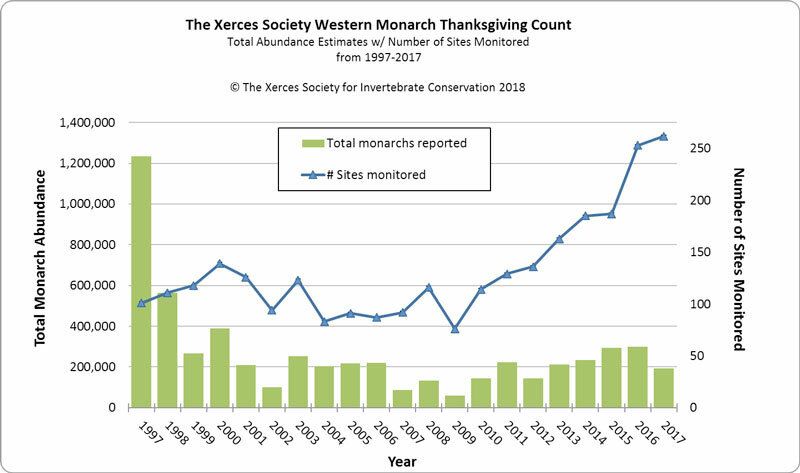 Formerly known as the Thanksgiving Monarch Counts, this program has expanded to include New Years counts and is now part of the Western Monarch Count Resource Center. Data Availability: Much of the data are available online. Contact Candace Fallon for more complete data availability. Effort Tracking: Time spent counting is recorded. Protocol Notes: The counting procedure for this project is generally straightforward. Volunteers visit colonies near them during the early morning while monarchs are non-mobile. They can use binoculars to view clusters and estimate the number of monarchs per cluster, then extrapolate that to the remainder of the colony to derive an estimate of colony size. Jepsen S, Black SH. 2015. Understanding and conserving the western North American monarch population in Oberhauser KS, Nail KR, Altizer SM, eds. Monarchs in a Changing World: Biology and Conservation of an Iconic Butterfly. Ithaca, USA: Cornell University Press. Stevens SR, Frey DF. 2010. Host plant pattern and variation in climate predict the location of natal grounds for migratory monarch butterflies in western North America. Journal of Insect Conservation 14: 731-744. Vandenbosch R. 2007. What do monarch population time series tell us about eastern and western population mixing? Journal of the Lepidopterists Society 61: 28. Frey D, Schaffner A. 2004. Spatial and Temporal Pattern of Monarch Overwintering Abundance in Western North America. Pages 167-176 in Oberhauser KS, Solensky MJ, eds. The Monarch Butterfly: Biology and Conservation. Ithaca: Cornell University Press.